Book Anders Fogh Rasmussen as a keynote speaker. Anders Fogh Rasmussen has been at the centre of European and global politics as Secretary General of NATO (2009-2014), Prime Minister of Denmark (2001-2009). For more information on geopolitics speaker Anders Fogh Rasmussen, contact VBQ Speakers founding agent Leo von Bülow-Quirk on leo@vbqspeakers.com or 0044 7833 727090. Anders Fogh Rasmussen has been at the centre of European and global politics for over three decades as Secretary General of NATO (2009-2014), Prime Minister of Denmark (2001-2009), Danish Minister of Economic Affairs, and, last but not least, as a leading Danish parliamentarian. He began his political career in 1978, becoming the youngest member of Parliament in Denmark at the age of 25. He was promoted to Minister of Economic Affairs in 1990 and became Prime Minister of Denmark in 2001. He held this position until 2009 when he was appointed Secretary General of NATO. During his tenure, he developed a Strategic Concept, which sets the Alliance’s core priorities for the future. In the wake of the financial crisis, he implemented Smart Defence, a strategy that encourages multinational defence to enable member-states to make more efficient use of their resources. In response to Russia’s aggression against Ukraine, he initiated a “Readiness Action Plan”. Multinational cooperation has been a key tenet of Anders’ approach to global politics. He has repeatedly encouraged stronger ties between the world’s democracies, and his time at NATO worked towards the goal of creating an integrated transatlantic community by creating a global network of international security partnerships. This is a goal that he still works towards to this day through Rasmussen Global, an international consultancy organisation which provides geopolitical and strategic counsel. His latest book is The Will to Lead: America’s Indispensable Role in the Global Fight for Freedom (2015), in which he argues that American leadership is crucial for stemming the growing tide of authoritarianism around the globe. 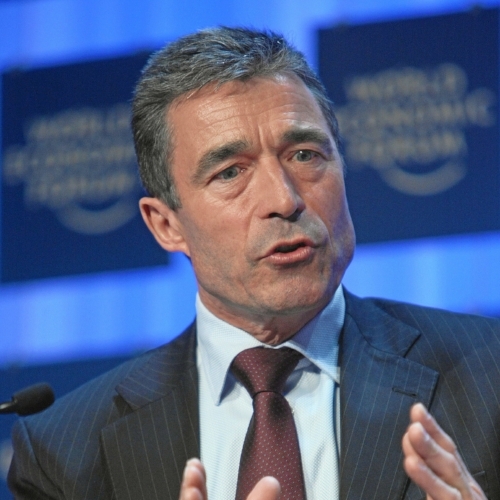 An experienced statesman and leader, Anders Fogh Rasmussen has been at the centre of European and global politics for the past three decades. His talks offer innovative and practical insights for understanding the risks and opportunities in geopolitical landscape.